It is 20 years since the Exxon Valdez supertanker ran aground in Alaska, spilling 38,000 tonnes of crude oil into the sheltered waters of a picturesque sound. It wasn't the biggest oil spill recorded but it was, arguably, the most iconic. The ripples from the Exxon Valdez's accident in 1989 continue to be felt to this day. And it's not just the waters of Prince William Sound that have been altered. The oil industry itself has had to adapt. The spill killed thousands of seabirds, seals and sea otters and poisoned millions of fish. The sticky residue fouled 11,000 square miles (28,380 sq km) of ocean and over 1,250 miles (2,000km) of coastline. The images of oil-covered seabirds made newspapers front pages all over the world and the disaster became one of environmentalism's most iconic moments. This was not a spill in the crowded supertanker routes in the Persian Gulf or in a dilapidated port. It took place in a stunning Alaskan landscape, the home of humpback whales, orcas and thriving salmon fisheries. 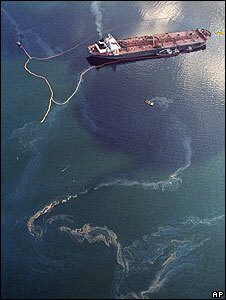 On 24 March 1989, the Exxon Valdez ran aground on Bligh Reef in Prince William Sound. The collision ruptured the tanker's hull, causing thousands of tonnes of poisonous crude oil to gush into the sheltered waters. The oil soon spread to the shallow water and rocky coastline of the sound, which was only reachable by boat and helicopter. More than 11,000 Alaskan residents helped in the ensuing clean-up, which included scouring oil-smeared rocks with hot water jets. Others tried to save oil-covered birds and mammals, who faced a slow death from the oil's destructive effects on their feathers or fur, or from organ damage caused by ingesting the toxic sludge. 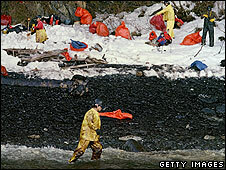 Dr David Santillo, a senior scientist at the Greenpeace Research Laboratory, says the Exxon Valdez spill's physical effects are still being felt to this day. "It's clear that oil spills in general give an opportunity as a learning experience every time they happen." One of the biggest lessons is the lingering effect of an oil spill in a sheltered area with soft, sandy sediment - exactly the kind of environment found in the shallow areas of Prince William Sound where some of the oil came ashore. "The most important thing is to stop the oil leaving the ship in the first place - once its put in water and can impact on sediments it's much more difficult to deal with," he says. "The oil can be quite rapidly buried by fresh sand and it's very difficult to know where it is - and it's only now turning up years afterwards." The Exxon spill, Dr Santillo says, also showed that the scouring of the rocky coastline to get rid of oil sludge might not always be the best approach. Boiling water jets were used to scour the rocks and dislodge the oil residue - a common practice at the time. But the process also stripped the rocks of the small animals and plants vital to the food chain. Some of those also help break down the oil itself. World Wildlife Fund's head of marine programme Dr Simon Walmsley says it can sometimes be better to let nature take its course. It was a blessing, he says, that the remote location and harsh conditions meant only a fraction of the normal amount of chemical dispersants were used. "It is possibly quite a good thing not many dispersants were used - the dispersants, in some cases, can actually be worse. They can be very toxic," Dr Walmsley says. "When you look at the effects of natural weathering, it can actually be better than intervention," he adds. Winds, tides and bacteria can do the job just as well, he says. Oil spill expert Dr Stephen Mudge, a senior scientist at Exponent International, says: "The technology has certainly changed since the Exxon spill, where chemical dispersants and water scouring was used. We just don't do that anymore, there are much better ways." A new solvent based on vegetable oil with a few additives can easily wash oil off the beach, he says. Other absorbing agents have been made from wood fibre, and trials have been carried out using booms used with human hair taken from the floors of hairdressing salons. Since the Exxon Valdez, the calls for safer ships to carry the world's crude have grown louder. The spill hastened US legislators to pass laws making it illegal for single-hulled vessels to use US ports, in favour of more solidly-constructed, double-hulled vessels. Later spills off the coast of France and Spain made it law in Europe too. Vessels plying the icy, unpredictable seas off Alaska do so with more caution, with GPS, real-time weather forecasting and more mapping on ocean areas where icebergs are present. But while the Exxon Valdez spill made front-page news, it did not take the risk of similar spills to zero. The warming of Arctic waters, with ice receding and new shipping lanes opening up in years to come, has some experts worried another big spill could take place. 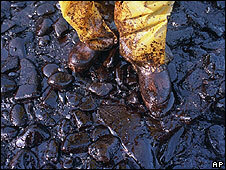 The Exxon Valdez spill came from human error, and humans are still part of the equation. "The weak link is the soft squidgy bit - us - at the controls," Dr Mudge says.